This is a totally unassuming, what you see is what you get kind of dish. Simple, Easy and tasty as much as it is pretty. Traditionally, kosambari is made as part of a festive spread and vice versa. Last one sounds weird? It is an awesome way to include raw radish into your diet and tastes wicked awesome too. Still skeptic? 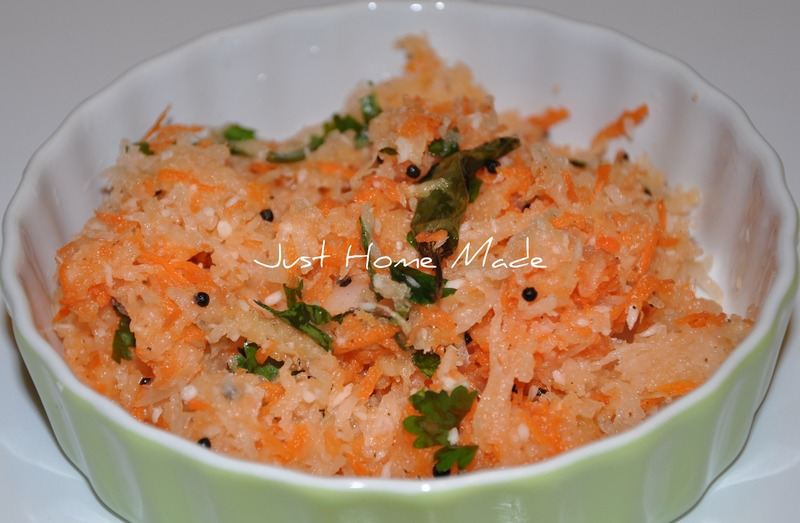 Carrot neutralizes the pungency of radish and makes for a wonderful co-ingredient. Try it and you’ll agree with me. Take a look here. Wash the dal again and drain off all the remaining water. Though it seems redundant, this is an important step as it rids the dal of the soaked in smell. Heat oil in a small kadai or skillet. When the oil is really hot but not smoking, add in the mustard seeds. Oil is hot enough when the mustard seeds start spluttering as soon as you add them. Add hing and green chillies and sauté until they turn a slight white. switch off and keep aside. Do not skip the tempering as the spluttered mustard, hing and green chillies mix is what lends the kosambari it’s characteristic taste. Add the tempering to the other ingredients, mix and serve immediately. 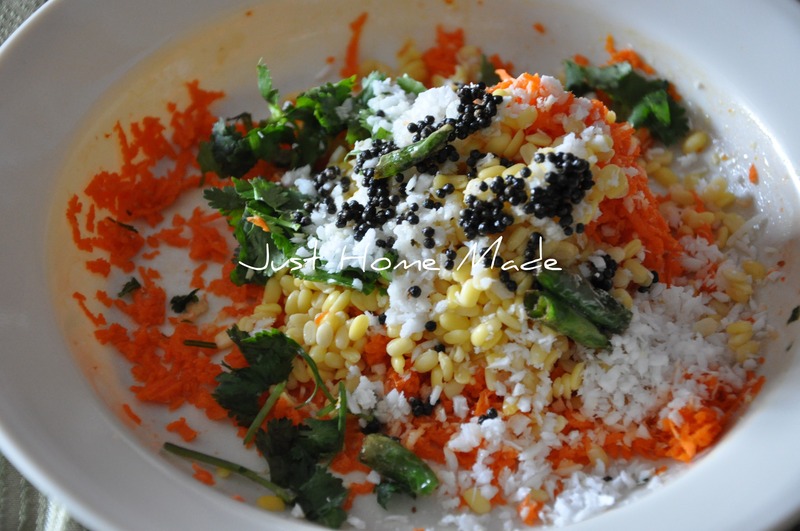 When part of a full course meal, kosambari is always made last so it can be served fresh immediately as the salt makes it watery if it sits longer. Great salad Radhika ! Do we need to cook the dal or add it raw ? Sonia, absolutely No cooking, those lentils are soaked..